Our faces are our billboards to the world. They are telling the people around us how we’re feeling, whether it’s okay to approach us, what kind of person we are. What is your face doing when you’re not keeping an eye on it? But you know what I hate more? Feeling unprepared. Forgetting what I wanted to say. The clammy feel of my palms sweating as I realize I’m not sure I checked my slides after the last time I used them to make sure they’re updated with this client’s info. I practice so I will feel great. I practice so I can forget about the content and concentrate on the audience. I practice because the people who are taking time out of their day to listen to me deserve it—whether I’m leading a meeting, holding a call, or giving a keynote. It’s very easy to be too busy to practice and prepare. But it’s worth it to slow down, take your time, and make sure you’re ready to connect. I’ve been reading and working through a revolutionary book. It’s not Karl Marx or Tim Ferriss or the latest by Yuval Noah Harari. It’s “Become a Supple Leopard,” by Dr. Kelly Starrett. Starrett is a physical therapist and trainer, and he started out as an athlete himself, paddling for the US canoeing and kayaking teams. In this hefty book, Starrett takes the reader through the mechanics of the body, explains where chronic pain and limited function come from, and details hundreds of techniques to get the body back in effective position (and out of pain). The title of the book comes from the idea that leopards don’t need to stretch or warm up in order to be at their best—their lifestyles and natural movement patterns support them always being ready to leap into action. In our coaching work, we often run into something that seems like a paradox: we are coaching clients to be authentic communicators, to be relaxed and genuine. At the same time, we know that there are vocal and physical patterns that are distracting to audiences and that take away from the impact of even the most intentional communication. Sometimes clients say, “I’m just more comfortable this way,” as they pace relentlessly, twist one leg around the other, or end every sentence with an upward inflection. And they’re telling the truth—it does feel more comfortable. In Starrett’s work, he would say that these are learned habits, repeated for years, that have actually physically changed our bodies—shortened ligaments, made some muscle groups compensate for others, and kept some from working much at all. And the irony is that these habits that make us feel comfortable are the same ones that finally cause us injury when the adaptation breaks down. The same is true in our coaching. The habits and routines we’ve all built to protect ourselves from feeling vulnerable when we communicate are the ones that keep us from showing up powerfully when we need to. When we cross one leg in front of the other, teetering, we take away the stable base that demonstrates we are comfortable in front of the room. When we pace without stopping, we deny the audience a chance to pause and take in our message. When we vocally connect every thought with the one in front of it, never landing a sentence, we strip the impact silence can have. The answer to the paradox is that what may seem comfortable is merely familiar. And to generate the outcome you want, whether it’s to become a supple leopard or to move your audience to truly hear you, you’ll need to get out of that comfort zone. We all know that weddings are big business. What they also are is a fascinating place to learn about other people. In the last couple of decades, wedding planning has begun taking an a la carte approach. The couple notices what they’ve experienced at other weddings, they incorporate some parts and leave others out. Many elements of an American wedding that would have been standard forty years ago (church or temple, cake, white dress, wedding party, garter, bouquet) are now negotiable. This means that as we experience a wedding, we learn about the couple. Everything from the venue to the officiant to the clothing to the music to the vows to the food tells us who they are and want to be. The intentional planning of this major life event is incredibly personal. It makes sense that we are intentional about our weddings. They are a big deal. We want each detail to be something we love, something that reverberates in our memory forever. What would it look like to bring that level of intention to our everyday conversations? What would it mean to slow down, to think specifically about the choices that we are making and how they will affect those around us? Each utterance doesn’t have to be planned like wedding vows, but to think, “How is what I’m about to say going to land on this person? What do I really mean?” is a powerful practice. Do. Not. Memorize It. I’m serious. My colleague Neela describes the phenomenon of watching someone deliver a speech from rote memory as being like they are reading it from a ticker tape right in front of their eyes—they aren’t connecting with the audience because their brain space and focus are all taken up with remembering the speech word for word. For most people, memorizing a speech word for word is going to result in a speech that comes off as rote and robotic to the audience. The speaker has dedicated all her prep time to memorization instead of working specifically on what impact she wants to have on her audience. This is misplaced time and energy. One other problem with memorized speeches is that the people who write and deliver them are often at the mercy of their more “writerly” phrases and structures. Most people don’t write a presentation as if they are actually going to say it out loud; they write it as though it’s going to be read. So when it comes time to say it out loud, it sounds strange and stilted. How do we avoid that? Practice out loud. Note what sentences and phrases sound awkward. They may have been fine on the page, but they aren’t going to translate to the stage. If you insist on memorizing, remember you’re going to have to put about twice or three times the amount of time into preparing. This is because once you’ve memorized it, the real work begins—making the presentation seem natural, and connecting with your audience. There is only one person who cares what you do with your hands when you are making a presentation. And you shouldn’t care, either. Here’s the thing—if you are connecting with the audience, they don’t care. If you have carefully considered what you want them to get from your presentation, it doesn’t matter what you do with your hands. In fact, when you have spent thoughtful time creating the experience you want the audience to have, your hands will take care of themselves. When you are worried about your hands, it’s a sign that some other work has not yet been done. Go do that work. What will happen if I slow down? Did you ever have one of those days? A lot to do, a lot that I’m excited about, and it’s all making me move a little too fast. I can’t even type without tripping over my fingers. 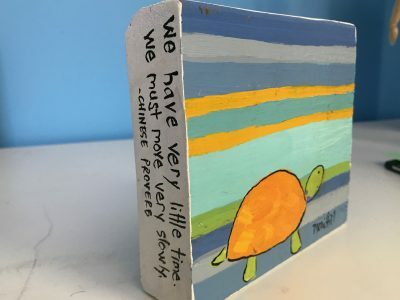 What if, and stay with me here, the power of our great work is in slowing down? What if we actually cannot do the work we’re capable of when we’re in overdrive? And when we choose not to slow down, when we keep saying “yes” and squeezing more and more into our packed calendars…what are we losing out on? What are we afraid will show up if we make space for the “fertile void”? You travel so much, and I am alone. I never heard the man say anything. They left in separate cars. When you have to do something you don’t want to do, how do you talk to yourself about it? It can feel comfortable and familiar to be mad, to be resentful, to roll around in our grumpy feelings, to talk to other people about how much we don’t want to do whatever it is. The voice that sets the tone isn’t the one of the person who tells us what to do. It’s the one in our head that tells us how to feel about it. A quick way to relax, reset, and energize! Has your coffee worn off? Are you feeling anxious or out of sorts?